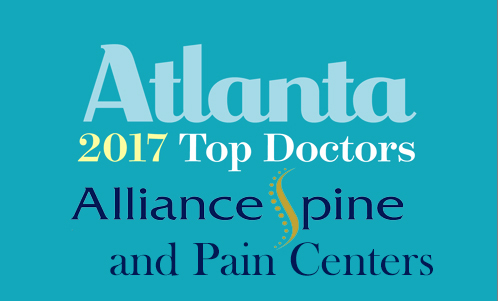 Congratulations to four Alliance Spine and Pain Centers providers for being named to Atlanta Magazine’s 2017 list of “Top Doctors”. Dr. Allen Hord, Dr. David Gale, Dr. David Rosenfeld and Dr. Michael Schaufele were recognized in Atlanta Magazine’s annual list published in their July issue. Drs. Hord, Gale and Rosenfeld were selected for their contributions in Pain Medicine, and Dr. Schaufele for his contributions in Physical Medicine and Rehabilitation. In fact, this Alliance team makes up over 25% of the Top Doctors selected in these categories. The team’s mission is to offer innovative, non-invasive solutions to patients in chronic pain. These four are not new to the prestigious list; 2017 marks Dr. Hord’s seventh year to earn a “Top Doctor” title, Dr. Schaufele’s sixth consecutive year, and Dr. Gale and Dr. Rosenfeld’s second year in a row. The “Top Doctors” list is compiled by established healthcare research firm Castle Connolly Medical Ltd. Since 1991, Castle Connolly has been dedicated to helping consumers find the best health care in America. Castle Connolly “aims to identify the top 1 percent of specialists and sub-specialists” in the United States. To compile the annual “Top Doctors” list, Castle Connolly uses a survey and research process involving tens of thousands of top doctors across America and the medical leadership of leading hospitals. Atlanta’s top doctors are selected after peer nomination, extensive research, careful review and screening by Castle Connolly’s doctor-directed research team. Atlanta Magazine uses the research by Castle Connolly to provide detailed information about education, training and special expertise of Atlanta doctors. Kudos for the service and care that Alliance’s “Top Doctors” are providing to Atlanta and surrounding markets!